SEE MIRAdance.com for the latest! At our PraiseMoves National Conference in June we certified the world’s first MIRA! Instructors from among the ranks of our Certified PraiseMoves Instructors in the US and Canada. Be sure to check the Certified PraiseMoves Instructor listings to see if your local CPI (Certified PraiseMoves Instructor) is now also one of the 18 new CMIs (Certified MIRA! Instructors). MIRA! means “LOOK!” in Spanish. Our foundations scripture for MIRA! is found in Isaiah 45:22 where the Lord says, “LOOK to Me and be saved, all you ends of the earth, for I am God and there is no other.” What a powerful truth! 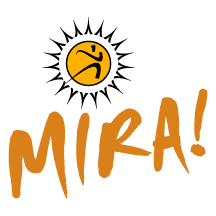 Below is a video I did for MIRA! using a FAST, more athletic version of the Come & Dine step (translates to the Cumbia step in Latin dance). As we are TEACHING the initial step the feet move with the beat to these words–“Come and Dine / the Master’s calling / Come and Dine!” (taken from the disciples’ experience with the risen Lord Jesus in John 21:12). In this way, the student learns the dance step AND a scripture or a scriptural truth to accompany it. As with all we teach in PraiseMoves Fitness Ministry, the exercise (or dance) is the “hook.” The “meat” is the Word of God we meditate upon or speak aloud during our workout. Here are some of the words from the song you will hear in the video below. Raza for Christ’s songs are available on Amazon and iTunes. Chorus: Race for Christ again here singing. We have been representing the powerful One. With this pace we continue giving, giving. The Radical comes to sing to the King of Kings. Of course I have come to represent Him – To change my lament into dance. He deserves the glory, I give my praise! This pace—I cannot stop it. A new Race for Christ sings so that you can enjoy. Distributing the living Word. I recognize Jesus as the only way out – and singing anew, I am still preaching. Rap, reggaeton and cumbia music I am listening to. This is the new message you are waiting for. Lifted hands — keep praising! Raza for Christ here singing as Christ commanded. I’m still giving, giving of what’s new positive word out of my mouth. And can you find the part of the song that says this? El Espíritu Santo de Dios que entra y te toca – toca toca toca toca toca y te toca toca tocara ? It translates: The Holy Spirit of God enters and touches you. He touches, touches (tap-tap-tap)! He touches you – He will touch you! Come Join us in MIRA! as a Certified PraiseMoves Instructor and MIRA! Instructor to bring this exuberant form of Christian Fitness to your community. And be on the lookout for the first MIRA! DVD later this year. Gloria a Dios! You will also notice we now have PRAISEMOVES GOLD INSTRUCTORS, too! PraiseMoves Gold Instructors have been specially trained to teach PraiseMoves to seniors and those with physical challenges. Look on the Certified PraiseMoves Instructors pages for the CPI, CMI (Certified MIRA! Instructor) and CPGI (Certified PraiseMoves GOLD Instructor) nearest you! You may do PraiseMoves modifications at home using the 20-Minute PraiseMoves DVD (has beginner, intermediate and advanced workouts on it). Follow along with the modifications using a chair – anyone can do it!